Marshall Hall's "Brighter One" on TV's "Hart of Dixie"
The CW network recently welcomed a new voice to their television show "Hart of Dixie." While Southern Gospel audiences and Gaither fans know this voice well, many new fans were able to hear the sounds of this terrific singer and his fresh music. The voice of Daywind Records' artist, Marshall Hall (formerly of the Gaither Vocal Band), with his brand new single, "Brighter One," was featured as a part of the April 30th episode of "Hart Of Dixie." Based in a small town in Alabama, the show centers on Zoe Hart (played by Rachel Bilson), a native New Yorker and recent medical school graduate, trying to adjust to life in the South. The show also stars Jaime King, Scott Porter and Tim Matheson. 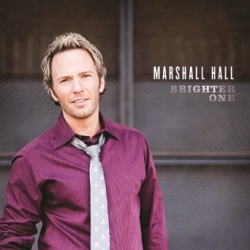 “Brighter One” is the title track from Marshall Hall’s 2012 GMA Dove Award-nominated project, Brighter One. The single, released to Southern Gospel radio this month, is already receiving a positive response from DJs across the country. Brighter One is available at Christian retail stores across the country and digitally at iTunes and other outlets. For more articles featuring Marshall Hall, click here.